The significance of Little Foot is hard to overestimate. 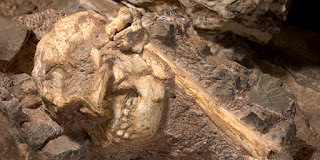 The discovery was made in a very roundabout way, with a loose ankle bone (hence "Little Foot") first found among rock removed by miners decades before. The discovery inspired Clarke to send his assistants into the Sterkfontein cave to see if they could find what the ankle bone belonged to. What came to light was the only truly complete skeleton of an australopith ever discovered. In the world of hominin fossils, skeletons are generally discovered in pieces spread out and requiring reconstruction to put them back together. For example, the famous Lucy skeleton (Australopithecus afarensis) was found in a jumble of pieces. Finding bones articulated (as in life) is extremely rare, which is what makes the multiple examples of articulated Homo naledi bones such an exceptional discovery. Little Foot beats even H. naledi, though, and by a wide margin. Little Foot is a completely articulated skeleton, as if the creature crawled into the cave, died, and was buried without disturbing the arrangement of the bones. This is an unprecedented level of detail for a single australopith skeleton. We already have a few details about Little Foot that make the publication quite tantalizing. Sterkfontein is famous for its fossils of a species called Australopithecus africanus (southern ape of Africa), but Clarke has called Little Foot Australopithecus prometheus, reviving a name used by Raymond Dart for other fragmentary fossils from South Africa. A. prometheus isn't a name widely used, but I guess Clarke thinks Little Foot vindicates Dart's recognition of two separate Australopithecus species. Another interesting detail is the opposable big toe, which is like the condition in modern gorillas or chimpanzees (and distinct from modern humans). There have been several attempts to date the Little Foot skeleton, with the preferred date used by Clarke as 3.67 million years ago. An analysis published earlier this year suggested that the sediments containing the skeleton were not older than 2.8 million years. I do not know if Clarke's team will be commenting on that paper. The older date is certainly more intriguing, since this "period" of hominin fossils is currently pretty sparse for species and this skeleton would fill in that gap nicely (but it's not a "missing link"). Even if it isn't that old, this is still the most complete skeleton we have of a hominin with an opposable big toe. Having a straight big toe that doesn't move freely from side to side is considered an important adaptation for walking on two legs (bipedalism). So if you think human evolution is true, Little Foot might help you understand how the different skeletal adaptations for bipedalism came together. If you don't think human evolution is true, what's the big deal with Little Foot? I am extremely excited about the upcoming publications. In my previous baraminology studies (see here), I have repeatedly found a discontinuity surrounding a group of hominin fossils that includes modern humans. I believe that all the members of that group are actually human, and that includes things like Neandertals and the recently discovered Homo naledi. When H. naledi was published two years ago, I was emboldened by my research and predicted that the discontinuity around humans was real and would never be bridged. What? A discontinuity is basically a gap, a place where there are no creatures. This has long been a key part of creationist thought on biology: There isn't an unbroken chain of creatures from an evolutionary tree. Instead, we believe that there are individual trees in an orchard or forest, where each individual tree is surrounded by hard gaps, where there are no creatures. The problem of course is that we're ignorant and don't have enough information about the creatures in the world. We're constantly discovering new things, like Little Foot, which could show us that what we thought was a gap was not really a gap. Fossils like Little Foot could very well bridge the gap. Astute observers of my research have pointed this out to me. Any study of gaps is vulnerable to future discoveries that bridge what we thought was a gap. Finding things that bridge gaps doesn't mean that there are no gaps. It just means that one particular gap wasn't a gap. It could make the human family a little bigger and put the gap boundary somewhere else. Or it could include something really not human (like a chimp) in the cluster with humans, which would suggest that something went really wrong with my attempt to study gaps. After my last foray into hominin fossils, I got an email asking me if I thought the discontinuity was just ignorance, since we don't have that many fossils from 3-4 million "years" ago. I guess the implication would be that as we find more fossils that tell us about "human evolution," then whatever I'm doing with my little clustering will become irrelevant, since I would have proven to myself that humans are related to nonhumans. Or something like that. Regardless of the grandiose implications, it's a perfectly legitimate question, especially after I became so confident with H. naledi that that very scenario would not happen: We will not find a fossil that will bridge the gap separating humans from non-humans. That was a long winded explanation, and here's the punchline: I'm excited to see what Little Foot does to my clustering, just like I was excited the last time this happened with Homo naledi. Maybe I'm even more excited about Little Foot since I've known for years about this skeleton. I'm also eager to expand my research. Some of you know that my conclusions about hominin fossils have been publicly criticized recently. I have been hesitant to continue that "discussion" mostly because I didn't have anything more to say. My critic won't listen to what I've already published, and I remain convinced that more data are needed to help us develop a better creationist understanding of human origins. I have no doubt that my critics will continue to ignore me, but that's life. My goal is always a better understanding of creation not refuting my critics. If I had to guess at this stage, I would guess that A. prometheus (Little Foot) isn't human. That's a guess, though. I've been surprised before. I guess we'll find out. Now this is going up without any proofreading, so if it doesn't make sense, I appreciate your forbearance. I have to go to class right now!